Online DMS software to easily store, share, manage and approve your digital documents. Keeping your paperless office documents only on your computer or local server poses the risks of hard drive failure, fire, flood or burglary. And what if you want to access one of those important files away from the office? Meet Folderit. 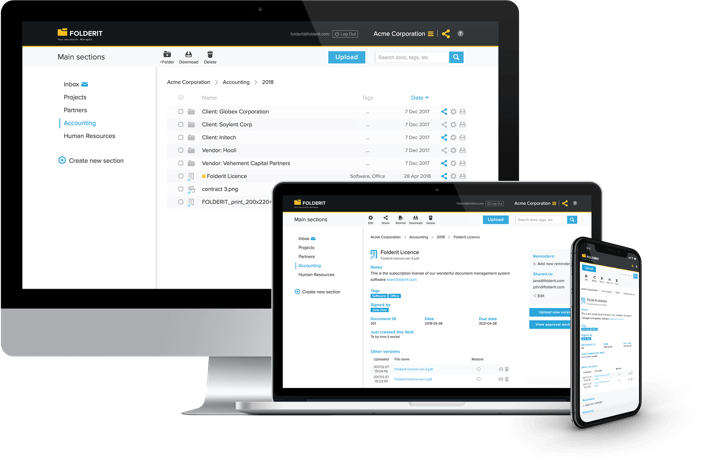 The ultimate online document management system for small businesses and organizations, the most user-friendly DMS in the world! We didn’t bulk it up with features real people never need. So, you can find the documents you need much more easily! 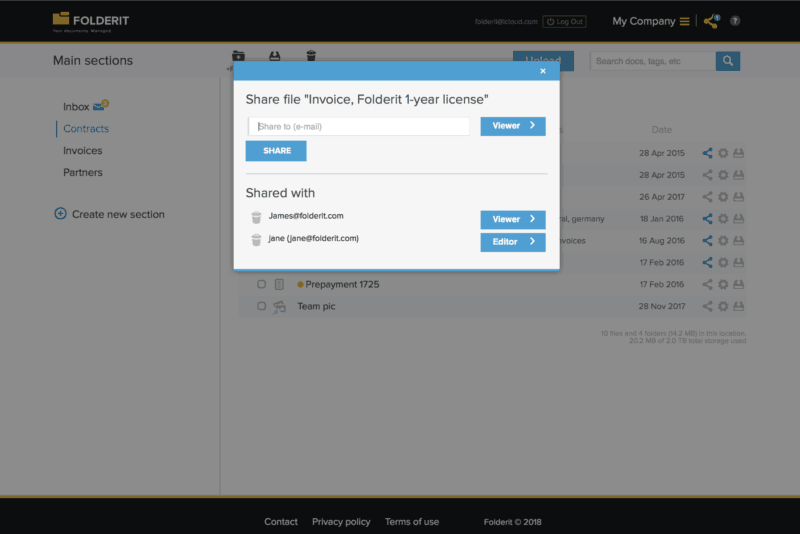 Share documents, folders, sections or even the whole account with different permissions to anyone you like. Create groups of collaborators to share to many people at once! Audit Trail for every folder gives you a great overview of every action taken in it by you or your collaborators. A powerful live-search function is built into our cloud document management software so you can search documents not only by the file name and metadata, like keywords and signers but also the content of the files thanks to Optical Character Recognition (OCR) technology. Does an invoice, vacation application or another document needs to be approved by one or several people before the next step? Not a problem! Invite people to approve and add their comments. In fixed order or all at once. It's never been easier to get and track approvals! 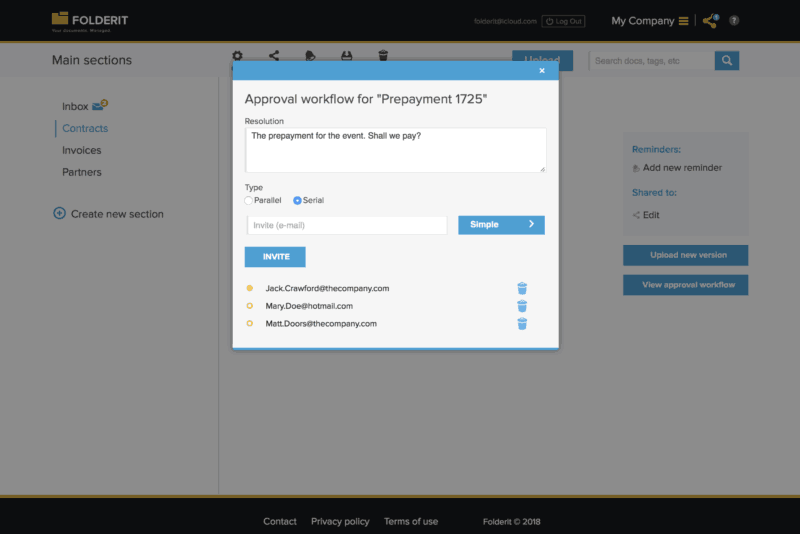 Learn more about Approval Workflow! 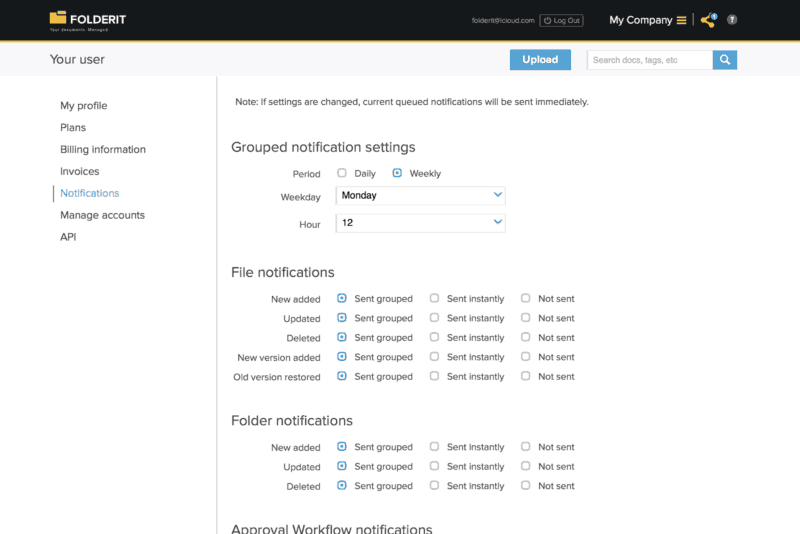 Set and get automatic notifications for changes in documents, folders or sections as often as you choose -- at the moment of the change or as a grouped notification once a day or week. Whenever someone adds a file, deletes something, etc. you will know who did what, and when. Add metadata such as keywords, signers, notes, date and due date to help organise your documents. You can easily add your own data fields! You can also link files to create relations between documents in different folder structures that belong together. It's easy in Folderit cloud document management software. You can upload a new version of a document and preserve the existing metadata and all earlier versions of the file -- which are always easily recoverable with just one click! A document check-in/check-out feature allows you to lock a document for others while you are editing it on your computer. Whenever you need a notification at a certain date and time, just set up a reminder! You can add as many reminders as you like and choose a different e-mail address for notification on each of them. For each of your account roles you receive a dedicated e-mail address. Just send/forward an e-mail to that address and the attached file will end up in your Folderit Inbox. It couldn't be any simpler, and it's perfect to store documents on the go! Although you can create unlimited hierarchy under your primary account role, you can actually add up to 5 additional roles! So, you can have one for your company or its divisions, others for you personal needs, clubs or whatever to share with the relevant people! 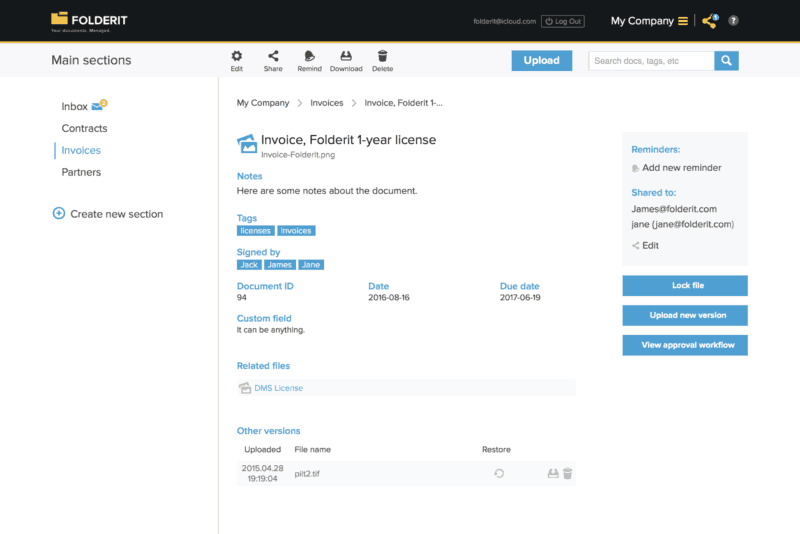 Your documents in the Folderit online document management system are accessible to you from every PC, Mac, tablet or smartphone with an internet connection. All over the world. Your documents are stored in a secure cloud and are perfectly safe, yet if you wish, you can easily download the whole account or individual files/folders to your hard-drive as often as you like for your local backup. All your data is triple backed up and bank-level encrypted in the Folderit cloud document management system where it's safely stored and is sent via secure SSL layer. Share documents, folders, sections or even the whole account. "Editors" can start adding files and folders themselves! Approve documents fast! Let approvers add comments to their decisions and have a real-time overview of the approval process! Set and get automatic notifications for changes in documents, folders or sections as often as you choose. Add default or custom metadata, connections with other documents and file versions. Paperless document management is a clear and easy part of everyday business for many companies and organizations worldwide. For those who have chosen Folderit.